Drug possession is one of the most commonly committed drug offenses in Oklahoma. While drug possession may not seem like a serious criminal charge, it is under Oklahoma criminal law, and the prosecution does not want to let you off easily. The severity of an Oklahoma drug possession charge depends upon the drug type and the amount seized; because certain drugs are considered more dangerous than others. An Oklahoma drug possession crime can be charged as a misdemeanor or felony, accompanied by hefty fines, community work hours, and the possibility of a permanent mark on your criminal record, so it is important that you consult with a Tulsa Oklahoma drug possession lawyer in order to protect your rights. The penalties for Oklahoma drug possession vary based upon drug type, quantity, and the record of the offender. First-time marijuana possession or possession of certain prescription drugs are typically charged as a misdemeanor. However, possession of certain street drugs like cocaine, meth, or heroin are automatically charged as a felony. A misdemeanor drug possession charge carries up to one year in jail and up to a $1,000 fine. A felony drug possession charge carries from two to ten years in prison and up to a $5,000 fine. It is rare for someone to be sentenced to prison for their first drug possession offense, but subsequent drug charges can carry up to twenty years in prison. It is important to understand the difference between possession and possession with intent to distribute. While five grams of marijuana found in your possession is consistent with personal use and possibly a misdemeanor, twenty pounds of marijuana seized from the trunk of your car is more consistent with possession with intent to distribute, a felony. A common factor in defending many Tulsa Oklahoma drug possession charges is how the drugs were seized by the police. The drugs may have been seized from your home, your car, or your person. In order to be found guilty of drug possession, the prosecution must prove not only that you were in actual or constructive possession of the drugs, but that you knew the drugs were in your possession. What if the police conducted an illegal search and seizure and your Oklahoma defense lawyer was able to prove it in court? It is possible that the drug evidence could be excluded by the court and not used against you. 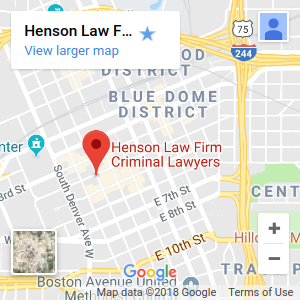 If you have been charged with possession of marijuana, meth, cocaine, heroin, ecstasy, or prescription drugs, you should speak with a Tulsa drug crime defense attorney at the Henson Law firm as soon as possible. Contact a Tulsa drug possession lawyer at the Henson Law Firm today!